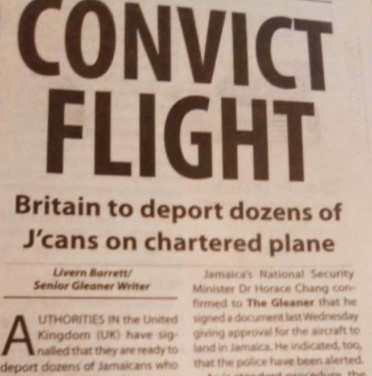 ‘CONVICT FLIGHT’ screams the Jamaican Gleaner headline in an article that quotes government sources confirming there will be a mass deportation charter flight on 6th February. The article contains operational details that are rarely shared by governments about these secret flights. It “reassures” people that these dangerous criminals will be met at the airport by police and questioned before being released. This level of detail, including the date is unheard of for charter flight removals and there’s only one reason for it: the Jamaican Government and UK Governments have entered into an unholy alliance to whip up a propaganda war to dampen public support for the British Jamaican community following the Windrush Scandal. 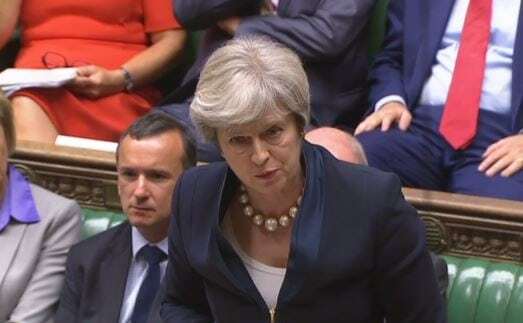 Theresa May’s government wants to restart flights that saw British citizens of the Windrush Generation removed to face death and destitution and they want to do it with minimal public protest. This will be the first attempted mass removal of Jamaicans since January 2017. This is a scandal. 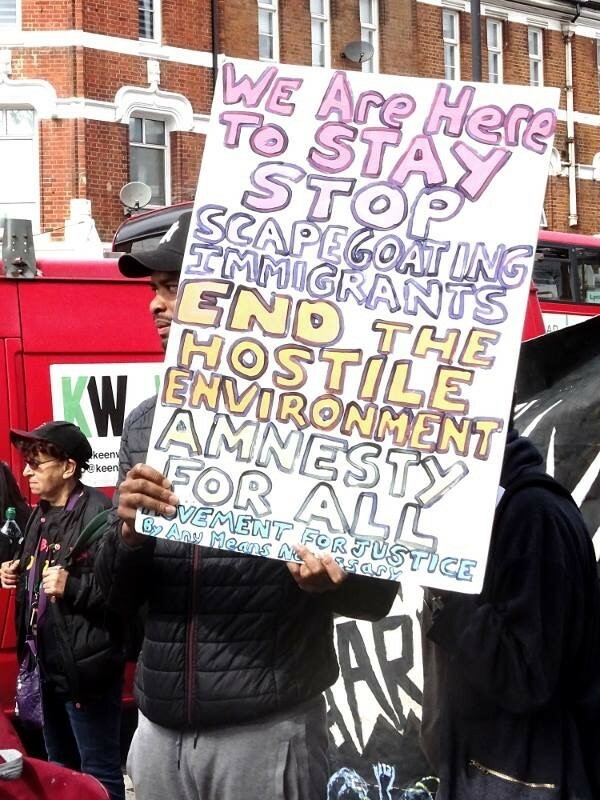 People of the Windrush Generation who were made destitute, detained and deported are yet to receive a penny in compensation, many are still struggling with debts and homelessness. 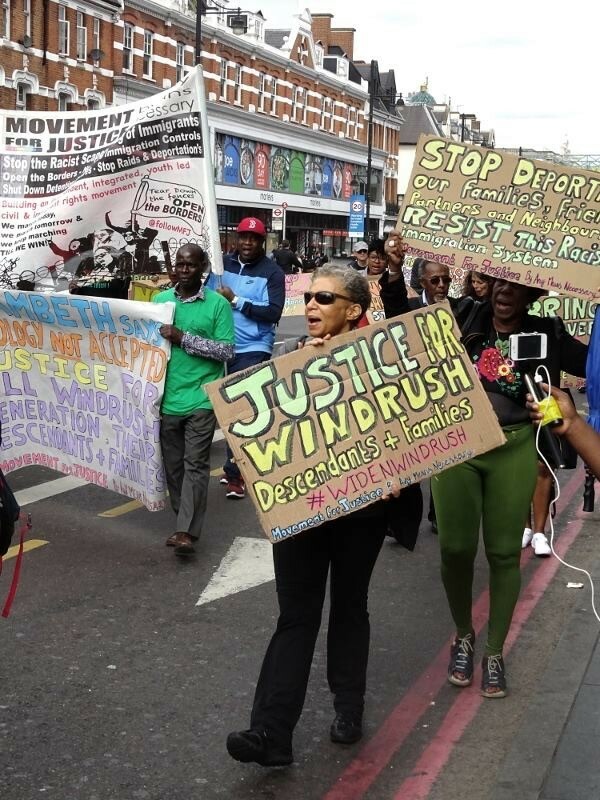 Even more are still waiting on a decision from the Windrush Taskforce, people like grandmothers Yvonne Smith and Yvonne Williams are coming up to a year waiting for a decision. 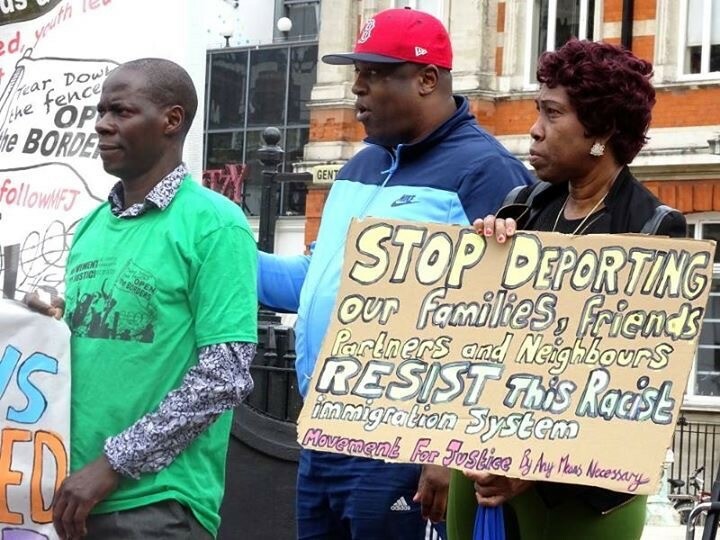 In the midst of this the government wants to restart mass deportation flights to Jamaica, which have been shown time and time again to be unjust and brutal tools of Theresa May’s government to reach their outrageous targets. The government believe if they limit those being removed to those with criminal convictions, so called FNO’s (Foreign National Offenders) they can escape public criticism. Immigrant rights and anti racist campaign group Movement for Justice has been speaking to those detained, locked up at risk of removal on this flight, people the UK and Jamaican Governments would have us believe are monsters. 24 people so far have been in touch. Here are just five of their stories. MB has lived 19 years in the UK, strong London accent because he came here when he was just 5 years old. His whole family is here, including his 11-year-old brother who he helped home school and speaks with such pride when he describes how his brother got into a top grammar school because of it. Never in trouble with the police growing up, always thought he was English, never dreamed he could be deported. He made what he describes as a terrible mistake and held some drugs for a friend and consequently faced a conviction that led to his Indefinite Leave to Remain (ILR) being revoked. Softly spoken and clearly depressed he speaks about his fear of being in Jamaica with no one, how he’ll be a target cause he sounds so British and knows nothing about how to survive in a country where the murder rate for returnees is so high a former senior police officer has told people to not return to Jamaica. OH has lived in the UK for 41 years, he came over as a 4 year old child to join his mother in 1977. He has a broad Manchester accent and has never set foot in Jamaica since leaving. He lived his life never imagining he could be deported because he’s always felt British. He spent 12 years as a youth worker teaching kids DJ skills, working for local councils and charities. He has is whole family here, including his Windrush Generation great aunt, now suffering with dementia. He has a British partner and 3 British children. He was convicted following a drunken fight; he served his time for that. Unlike those with the privilege of a British Passport who were born here he doesn’t get to move on with his life, he’s now faced with being ripped away from his family and the community he has served for his whole life. CS, 14 years in the UK, married for 11 years with a British born stepson who he’s raised since he was a baby, now 11 years old. The Home Office has told him the relationship is not important because he’s not his ‘real’ son, he can communicate with his son and wife over Skype. A Rastafarian man, his only conviction was an offence related to cannabis, something that has been part of his religion and identity since he was a child. His grandfather came over to the UK as part of the Windrush generation and he has extensive family here. He’s angry at how the system has treated him and even more worried for the kids he says are being sent back who know nothing about Jamaica and will get targeted because they are so clearly British, it’s a death sentence for them. DF’s grandmother came as part of the Windrush Generation with her own mother, she worked her fingers to the bone in the care sector so that she could afford to bring her family over to join her. When he was 6 years old his grandmother brought DF over to the UK, determined to give him a better life. She raised him and when she could afford it she brought over his mum, her daughter to join them. DF describes how strong his grandmother was, how she meant everything to him. When she passed in 2013 he was thrown into a storm of grief and anger, as a result, age 18 while he was at college he was caught with drugs and was convicted. He had never been in trouble before that. He served his time but when he came out, his life was thrown into chaos when his Indefinite Leave to Remain (ILR) was revoked and he was told he couldn’t study or work. Now he’s terrified of being removed to a country he has no connection to anymore. CB’s whole family are here in the UK, his great aunty came over as part of the Windrush Generation and he’s terrified of being taken away from all he knows. He has been in the UK for 8 years, his father who runs his own barbershop brought him over aged 14 years old. He describes how he went through a hard time when he first came over, he found it hard to fit in and as a result when he was 16 years old he was convicted of robbery. He went through a restorative justice programme and says it changed his life, he turned things around, studied, went on to work in BMW and in various retail positions. He was working on a business plan to set up his own barbershop following in the footsteps of his father when he was stopped while driving and was then convicted for Driving Under the Influence. This Driving offence led to him having his ILR revoked and being detained, he was just 23 years old. He served his time, but this time he wasn’t allowed to rebuild his life, he couldn’t work and has been battling for his right to stay ever since. These stories are just a snapshot, every person due to be on that flight has a similar story. The truth is in the UK if you are black you face a disproportionate chance of being convicted, your sentence will be longer and if you happen to not have the right paper work that sentence is never served, you are faced with a double punishment. For many that double punishment will become a death sentence following deportation. The Lammy Review found that there is greater disproportionality in the number of black people in Prisons in England and Wales than in the US. Black people make up 3% of the population in England and Wales and 12% of the prison population compared with 13% and 35% respectively in the UK. Young immigrants who are brought up British, who know no other country are being criminalised by an unjust system that doesn’t just punish them and move on, it destroys their whole lives and places them in mortal danger. This is a racist injustice that must be exposed and dealt with. The Windrush Scandal and outpouring of public support finally broke the issue of FNO’s and we have seen more sympathetic press coverage for individuals in the past year than we have ever seen before. It’s time to break through the deep sense of shame and stigma around FNO’s, around the deportation of black and Asian British people who have fallen foul of this system. Sometimes the system can do well, like in the case of CB when he went through a restorative justice programme and turned his life around. But it didn’t take long for him to be a victim of that system again for a ‘crime’ that the majority of the British population would not think warranted deportation. This is the reality behind the outrageous headline of the Gleaner, it is the reality that the British and Jamaican governments would like to cover up. The 6th of February, the day of the charter flight is Bob Marley’s Birthday. As a passionate advocate for social justice here and in Jamaica I’d like to think he’d have been out on the streets protesting this terrible injustice. It is outrageous that Jamaica would take the UK’s blood money for the destruction of the lives of the British Jamaican diaspora, especially when the Windrush Scandal is yet to reach any sense of resolution. Yeah, a racist law, racist and brutal immigration policies. And you can go back in history and see racism embodied into law and see the struggle to abolish those laws. The free will you talk about is not free will, is forced destitution and the harassment of criminalisation.